This book is an account and technical assessment of Marx's economic analysis in Capital and other documents, with particular reference to the transformation and the surplus-value doctrine, the reproduction schemes, the falling real-wage and profit rates, and the trade cycle. The focus is on criticisms that Marx himself might have been expected to face in his day and age. Mark Blaug, Journal of the History of Economic Thought. How splendid to read a book on Marx that takes him seriously as an economist and plays proper respect to the logical structure of his economic theory.... [M]y advice is to read this book and to study it carefully because it is full of insights gathered over a lifetime of study of the classical economists. This is vintage Hollander: beautifully written, highly opinionated and extremely well researched. It is the culmination of decades of scholarship on classical and post-classical political economy. 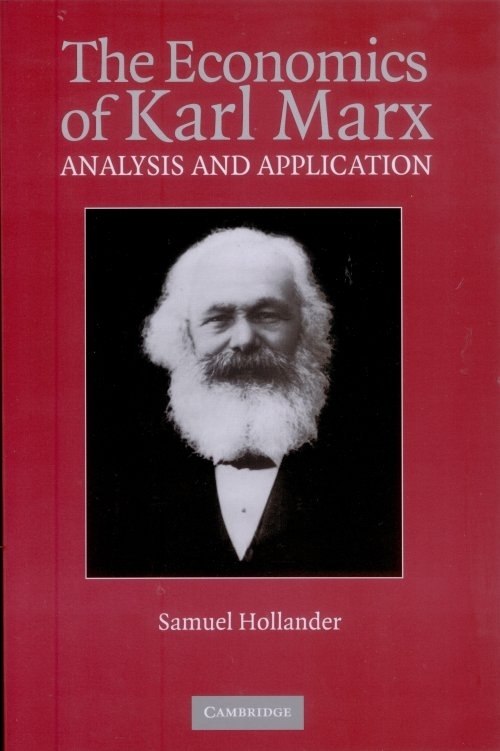 Many readers will question Hollander's interpretation of Marx as an unsuccessful predecessor of Walras, but few will fail to be stimulated, or provoked, by this book. For those hoping for an understanding of Marx and Marx's economics, the long wait is over. Samuel Hollander has delivered a masterpiece. All of the old disturbing puzzles are revealed and resolved: from value and distribution, to the falling rate of profit, growth and cycle and the thorny and infamous transformation problem itself. From cover-to-cover, the care and breadth of exposition, the insight and the scholarship are nothing short of breathtaking. This is truly a major event for economists, social and political scientists and intellectual historians, and no less a landmark achievement in the history of economic thought. All those interested not only in the historical Marx, but also in the true nature and significance of his work to modern economics and present-day concerns (including Marx on equity, the role of the entrepreneur and the process of social reform) will relish at the turn of every page of this wonderful book. Whatever one's view of Marx's exploitation theory and the 'continuity thesis,' as well as the many other topics covered in The Economics of Karl Marx, the book remains a superb achievement. The detailed arguments are typically first class, and always well presented.... All in all, this is a fine piece of scholarship of enduring value. Historians of economic thought will benefit most, but scholars from other disciplines will also find Samuel Hollander's book to be an excellent reference source. Hollander works through... topics with copious and helpful quotations from Marx's texts, which will make the book a very useful resource for students and scholars who want to make a preliminary survey of some aspect of Marx's economic thought. Another pervasive strength of the book is Hollander's knowledge of the classical political economy tradition, which allows him to situate Marx's thought in the matrix of the literature Marx worked from.... It will be well worth the trouble of anyone interested in navigating the huge volume of Marx's writings to consult this book. [T]he best book on Karl Marx’s economics written by anyone, Marxist or non-Marxist.